Place : Ludhiana ,Punjab ,India. 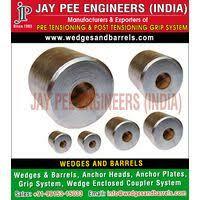 Jay Pee Engineers is manufacturing construction wedges in Ludhiana, INDIA. The GripFast wedge are used in the Mining and Tensioning market where 100% reliability is the benchmark. The product locks steel strand in the conical hole of the wedge block, GripFast barrel, ground anchor or double end joiner and allow transmission of the tension in the steel wire into the Anchors or Barrels. Every grip is subject to close Quality control. The anchorage systems wedges and barrels are also use in pre & post tension concrete manufacturing. We also have expertise in the manufacture of made to order ranges specific to your production system and requirements. 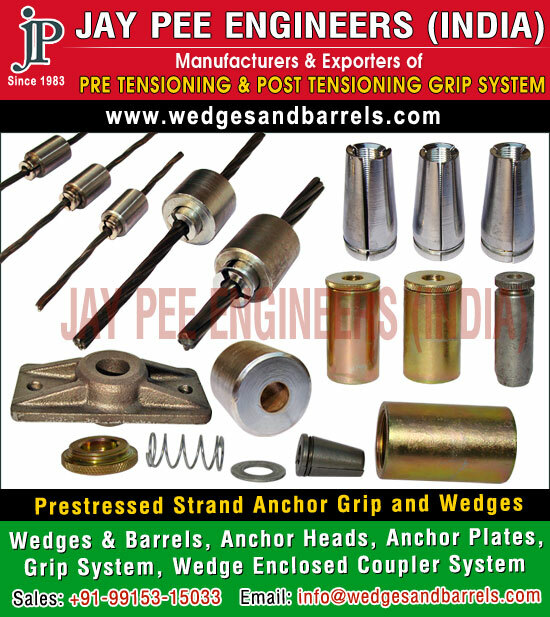 Jay Pee Engineers, is a Ludhiana INDIA based company, established in the year 1983 with the extreme efforts of S. Jaswant Singh Sohal to manufacture & supply of high quality Wedges and Barrels. Today Jay Pee Engineers is an ISO standard company. we are selling our products under “JAY PEE” brand to the domestic and International market.of manufacturing, sales and distribution. We are manufacturing construction wedges and barrels by automated process, highly resistant material, dimensional precision and a rigorous inspection system that guarantees maximum security and quality during prestressing and export products to worldwide.